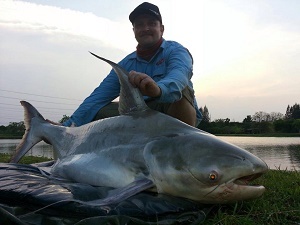 After predator fishing the previous two days at IT Lake Monsters in Thailand and catching some Big Chaophraya Catfish, Arapaima and Redtail Catfish, Jim and Amanda returned for their last day predator fishing. Fishing for the entire day with dead and live bait the anglers were soon amongst the predators with a steady stream of Redtail Catfish falling for mackerel fillets fished in the edge. The Redtail Catfish ranged between 10-30kg and gave the anglers lots of sport throughout the early part of the day. A change over to live bait later in the afternoon soon saw Jim casting towards some activity out in the central part of the lake. Jim was soon netting a lively Chaophraya Catfish of an estimated 20kg. Another cast to the centre of the lake saw the livebait snapped up almost straight away. This time the Chaophraya Catfish was proved to be a much larger specimen which fought every inch of the way to the net. 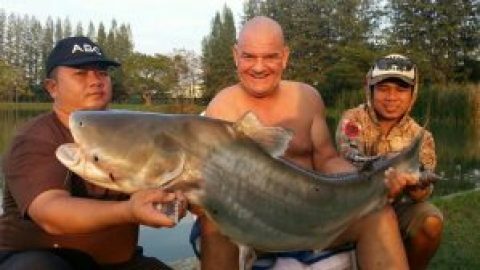 On netting the Chaophraya Catfish it was observed to be a very fat and muscular fish and was estimated to weigh close to 50kg’s. The catfish was quickly released after a few trophy shots before the decision was made to go back onto deadbait.